Are you looking to extend your living space? Building a Patio Enclosures® four season room is the perfect way to add square footage to your home and enjoy the view of the outdoors year-round. Scotia, NY homeowners moved into their new home in 2013. They enjoyed Patio Enclosures custom designed sunrooms in two of their previous homes, so the couple trusted the company to add a sunroom to their new home. After meeting with a Patio Enclosures design consultant, the couple decided on a traditionally-built four season room that was custom designed to match the style of their brick dwelling. 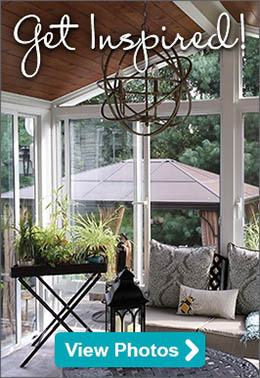 Unlike traditional floor-to-ceiling glass used in a typical Patio Enclosures sunroom, the homeowners had Stanek® triple-pane windows installed for ultimate energy efficiency, and a deck was added so they could enjoy the warm weather outdoors. 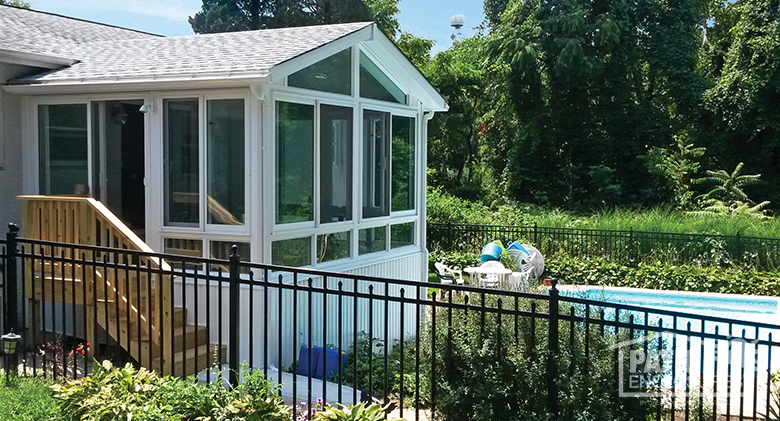 “Patio Enclosures has again proven their extraordinary capabilities in interacting with the customer and providing the superb contractor expertise needed to meet and exceed customer expectations,” said the Scotia, NY homeowners. Learn more about our Albany, NY location. 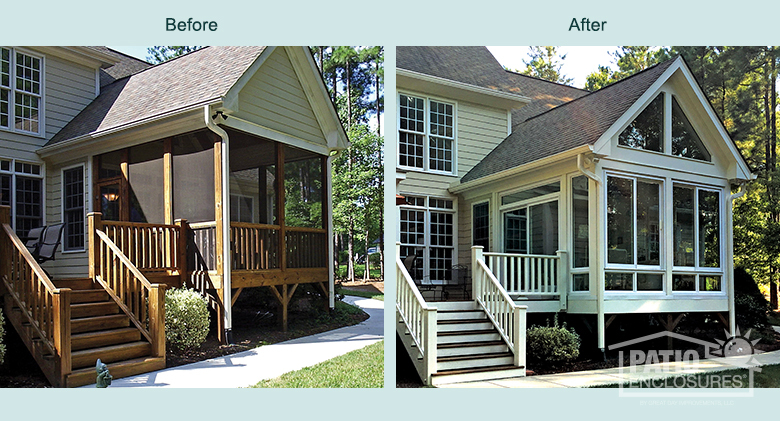 This North Carolina couple loved the unique character and charm of their covered porch but found themselves only using it during the warmer months. Patio Enclosures custom designed double-pane, insulated glass panels and transformed the porch into a four season room, which can be used year-round. To allow additional light to enter the room, the railing on the existing porch was replaced with a glass knee wall, which gave the homeowners a floor-to-ceiling view of the outdoors. A four season room can extend your living space and provide a cozy place to take in the beauty of the outdoors without having to leave the comfort of your home. 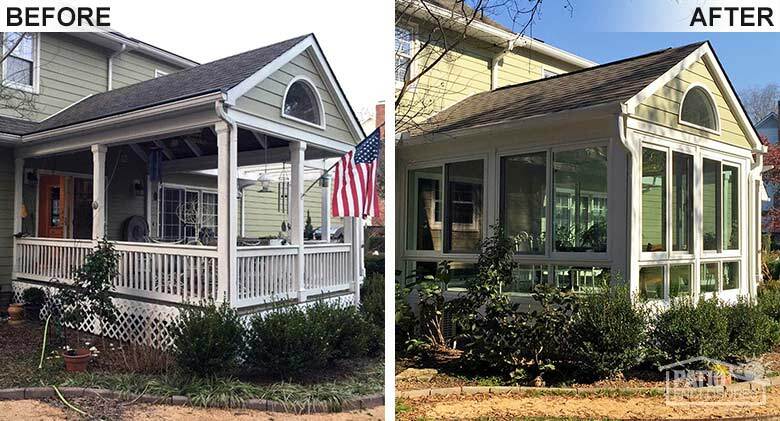 While their screened-in porch provided some protection from the elements during warmer weather, these North Carolina homeowners were looking for a way to enjoy the beauty of the outdoors in the cold, winter months as well. 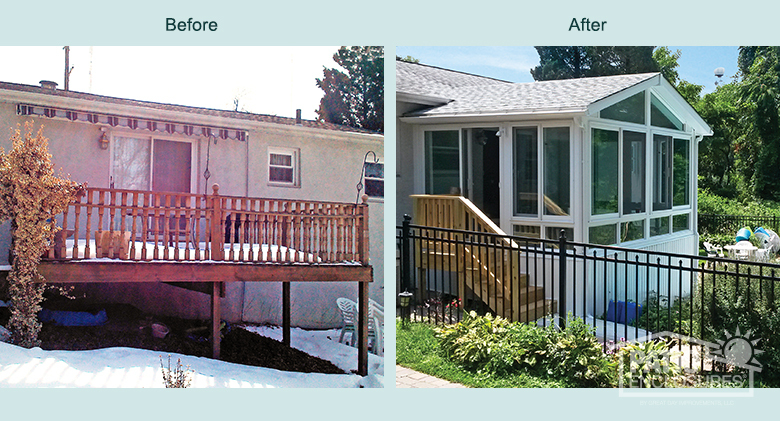 With the help of Patio Enclosures, these homeowners were able to keep the existing roof and design a custom-manufactured four season room to fit the space. The wall-to-wall, floor-to-ceiling double-pane insulated glass gives them expansive views of their beautiful backyard. Glass was custom cut and installed in the arch of the gable roof as well, allowing additional light to enter the room. Patio Enclosures four season vinyl frames are structurally reinforced with 4-point welded corners, are easy to clean, and less likely to fade, chip or scratch. Looking for a way to keep cool in the summer and soak up the heat in the winter, Philadelphia homeowners were in search of a custom sunroom addition. After receiving quotes from several companies, the couple chose Patio Enclosures because of their professionalism and outstanding customer service. After meeting with a Patio Enclosures design consultant, the homeowners decided on a four season room with a gabled roof that features gabled glass and glass knee walls, which allows the maximum amount of natural light to enter the space. Also known as a peaked or pitched roof, a gabled roof consists of two roof sections that slope in opposite directions from a center ridge beam. The homeowners are thrilled with the outcome of the room. Patio Enclosures four season rooms are a perfect way to enjoy the beauty of nature from the comfort of your home, regardless of the climate or time of year. If you are interested in learning more about enclosing an existing space on your home or looking to add on a completely new space, give us a call at 800-230-8301. We’d be happy to schedule a complimentary in-home estimate! 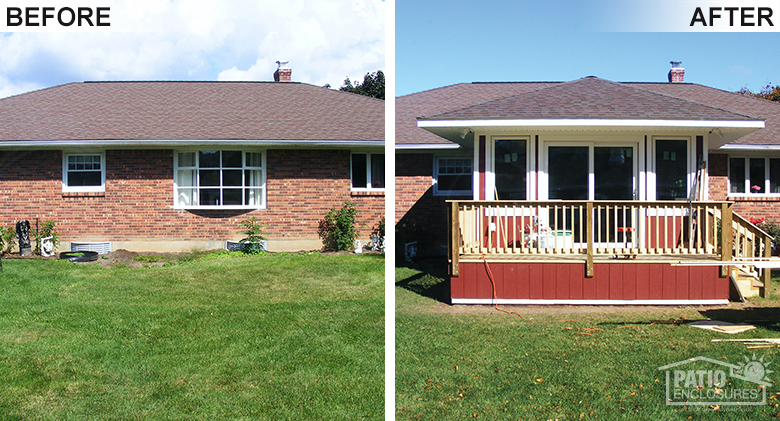 Deck, Patio or Four Season Room Addition - Which is Best for You?